Know Before You Grow: Broccoli and Cauliflower If you want vegetables that are loaded with vitamins and nutrients as well as delicious flavors and beautiful, eye-catching colors, look no further than our numerous varieties of Broccoli and Cauliflower! These really are “super-veggies”, packing a healthy punch in every scrumptious bite, offering heavy yields so you’ll have plenty of fresh produce for every meal, and proving hardy and versatile enough to satisfy everyone! Choosing a Variety All Broccoli and Cauliflower are packed with vitamins and nutrients, so when choosing what varieties to grow, you’ll base your decision mostly on size and color. There are several compact types that don’t require a lot of space, so they’re the best choice for a limited gardening area. Heat tolerance is also a factor, especially for those living in the south. And if you’re wanting to get your children to eat more healthy veggies, you might want to look at the more colorful, fun varieties! When to Start Broccoli seeds are best started indoors 7 to 9 weeks before the last frost, at a temperature of 70 to 75 degrees F. They can also be sown outdoors 2 weeks before the last frost. For a winter crop in zones 8 and warmer, sow in late summer( April). Expect germination in 10 to 14 days. The same guidelines apply to Cauliflower, except when starting indoors, sow your seeds 5 to 7 weeks before the last frost. Expect germination in 8 to 10 days. Since Cauliflower is more sensitive to cold than its cabbage-family relatives, you need to start it early enough that it has a chance to mature before the heat of the summer. Be careful, however, not to start it so early it gets damaged by the cold. Sow your Broccoli and Cauliflower seeds at a depth of 4 times the size of the seed, or ½ inch deep, and water thoroughly. Once the seeds have sprouted, be sure to keep the soil lightly moist. Make sure the plants receive plenty of light — fluorescent light for around 14 to 16 hours a day is also ideal for the fastest growth. You will want to keep the seedlings just a few inches below the light so they don’t “stretch” and get “leggy”. If you don’t have fluorescent lighting, a south-facing window will do just fine. Broccoli — 45 to 60 days from sowing to harvesting Cauliflower — 30 to 80 days from sowing to harvesting. Transplant your Broccoli and Cauliflower seedlings when they have at least two sets of true leaves. This should be done about 2 weeks before the last frost. Site them in full sun in a rich, moist, well-drained soil, spacing the young plants 18 to 24 inches apart in rows that are 2½ to 3 feet apart. Feed both your Broccoli and Cauliflower with a low nitrogen fertilizer when first planting out. For your Broccoli, fertilize again when the plants are 6 to 8 inches tall, 12 to 15 inches tall, and then when the buds first form. 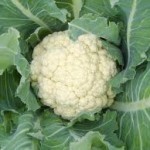 For your Cauliflower, fertilize again every 4 weeks. Keep the seedlings well watered and mulched( grasses & leaves) to retain moisture and keep the roots cool. Special Considerations If your seedlings have been held too long or mistreated in some way before planting, they can create “buttons”, or small heads, that tend to flower prematurely. Climatic elements such as extreme cold and drought can cause your plants to halt their full growth and form only “buttons.” Don’t allow your transplants to get too mature before moving them to your garden. If you do, they may become stressed by transplant shock. A starter fertilizer ( compost) applied when you transplant your seedlings will get your Broccoli and Cauliflower off to a good start, but it will not compensate for all the possible problems just mentioned. Beets, Onions, and Garlic are all good companions for your Broccoli and Cauliflower. Growing Tips Broccoli — once the head is fully developed, but before the individual flowers start to open, cut the central head along with 5 or 6 inches of stem. Removing the central head will stimulate development of the side shoots, which will allow you to continue your harvest for several weeks. Cauliflower — the heads (curds) develop quickly under proper conditions, typically growing to 6 to 8 inches within 7 to 12 days after branching begins. Harvest the mature heads (they should be compact and firm) by cutting the main stem. If the heads develop a coarse, “ricey” appearance, they have over-matured. Cauliflower does not typically have side shoots, so you can compost the plants after the heads have been harvested. Store fresh, unwashed Broccoli in your refrigerator’s vegetable crisper for 3 to 5 days. Put it in a loose or perforated plastic bad, being sure not to store it if it’s wet — wet Broccoli will quickly become limp and can get moldy. Its best flavor and nutritional value will be maintained if storage is brief. Uncooked Cauliflower can be stored in a paper or plastic bag in the refrigerator for up to a week. Place it stem side down to keep moisture from collecting in the florets. Pests and Problems to Watch For Aphids are often found on the underside of leaves. You can wash them off with a strong stream of water or use an insecticidal soap (be sure to follow the label instructions). Check the plants regularly, as aphids can be a recurring problem. Cabbage worms tend to attack the leaves and heads of related cole crops. Cole crops are crops that belong to the mustard family and have similar cultural requirements. They’re hardy plants that prefer cool weather. The most commonly grown cole crops are Broccoli, Cauliflower, Brussels Sprouts, Cabbage, Kale, Collards, and Kohlrabi. There are three species of cabbage worms — imported cabbage worms, cabbage loopers, and diamond back moth worms. They’re very destructive to plants, as they have a voracious appetite. Covering the plants with screening or a row cover can prevent the presence of these pests.